It’s easy to fall into bad habits when testing regularly or under pressure. Here are 6 simple tips that should help keep vehicle registration smooth and your customers happy. Don’t rely on job cards or other people’s notes when registering a vehicle for a test as they might not be up to date. You should confirm the vehicles details, such as identification number (VIN), vehicle registration mark (VRM) and colour with the actual vehicle. When searching for a record, using the correct VIN and VRM will help you select the right vehicle record. If you can’t find the vehicle record by searching, when creating a new record enter the full VIN and check that it’s correct. Remember that some vehicles can have dual VINs - such as motor homes, disabled vehicles or factory sports conversions. Making sure you have the right make and model can be difficult as manufacturers now have such a wide range of models. There aren’t always obvious differences between models so always check you’ve got the right make and model with the actual vehicle. Having the mileage on the MOT certificate helps to reduce instances of vehicle crime so it’s important that you record the right mileage first time. When recording the odometer reading make sure it’s recorded as it’s shown on the vehicle including if it’s in miles or kilometres. When registering the results, select carefully any reasons for rejection. 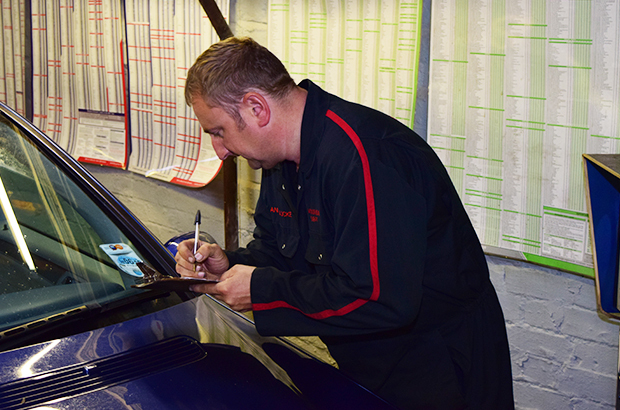 If you’re not sure at any point you can confirm the defects using the MOT inspection manual. Once you've entered everything, be sure to check it over one more time. Check that all the details are correct before the record is confirmed and the test documents are printed. By following these simple steps it’ll help prevent any problems down the line for motorists or fellow garages and testers. If you do make a mistake when registering a vehicle and you’ve already confirmed the record and printed the test certificate, you might be able to issue a replacement certificate if it’s within 7 days of the test by selecting the “replacement/duplicate certificate” section on your testing screen. If you’re unable to issue a replacement certificate or have any other problems you can contact the DVSA customer service centre for advice on 0300 123 9000. Am a NT going back to the 'dark ages ' of handwritten VT20's etc. , later a volunteer guinea pig on original computerisation Trial Stages in 2003/4 with Siemens . More importantly as an End User of current system feel that am amply qualified to offer constructive feedback in the hope that others using internet system may ultimately benefit. 12 months on with latest system DVSA proudly claim how many million Mot tests have been processed but at what cost ? or a stronger prescription. Reason being the size of typeface is too small on Mot Documents . The person(s) that designed docs could probably calculate volume of jam jar , however incapable of opening the lid. All crammed in in the name of saving paper or am I missing something ? but feel that overall is not much better . Why do we have Times Roman font when in modern times most documents are in Calibri similar to this DVSA website ? Also a reasonable size. 3 This view is supported by VTS admin staff who are dealing with the customers , and frequently comment that typeface is not easy on the eye and too small in size. 4 Whilst on subject of advisories we must all welcome the return of standard list of non testable but important items as on original comp. system , however how much is relevant in modern times ? Why (as in previous system ) are we not required to record total number of seats ? (as tested ) Feel this is most relevant with MPV vehicles as in a lot of cases the rearmost (row 3 ) seats and belts are not fully available for inspection as not erected and space is full of prams and such like items. 5 To many presenters of vehicles at VTS for Mot is merely a means to tax a vehicle, consequently NT's invariably are carrying out a cheap inspection rather than a basic roadworthiness test as it is meant to be under DVSA regulations. 6. How many conscientous NT's find that presented vehicle has No oil at all showing on engine dipstick ? ( despite being a mandatory knowledge requirement of UK Driving Test ) From my own experience estimate 5% of all vehicles presented show oil level on or near minimum level , with a further 10% below and not even showing on stick!---- To avoid a RFR CitroenC1/Peugeot 107/ Toyota Aygo with as little as 60k miles frequently require up to 2litres of oil when total sump capacity is only around 3.3 litres! 7 Insufficient coolant is also a problem to a lesser extent . Customers seem oblivious. 8 In conclusion suggest the public need educating on basic maintenance. 9 Finally on subject of VTS Homescreen layout could be more user friendly if of better design i.e. certain important headings such as test log and manual access points made more prominent on screen. Also items such as brake test (lock on squares ) made twice as big than at present. however careful one fingered ! I'm sure am not the only NT if truth were known. I am hopeful that you will have the courtesy to address my comments and reply in a reasonable time period. Totally agree with you, but hope on for a response. Have you noticed how the blog keeps being closed, then all of a sudden comments go on. I agree on all points, however if you hold down CTRL nad scroll the wheel on the mouse it does enlarge the screen size, unfortunately not the printout size. The team are aware of this issue and will be looking at resetting the profanity filter. just write threaded or slotted nail,,,,that works!! noticed lately that when doing a first test on a vehicle with remaining days it gives one less than it used to , such as a car that was registered 30/04 /2013 , if it was tested on old system & passed it would have run until 30/04/2017 , on the new system it runs until 29th ???? not related to this but I would like to know when the non component related advisory section is going to be added to the new system?? Why when registering a car say for the first mot and you have to click on the vehicle class why do you then have to put in your pass word again! Surely if you've got that far your not a bogus mot tester trying to hack into it! Quite agree with that, I'm sure DVSA will let us know,,,, ONE day !!! Please can manufacturers spend another few pence per car and make it so that parking tickets can't slide down and cover up the VIN! It seems one in ten of the cars I test I have to fish out with cardboard, hacksaw blade, etc.! why don't you in that case just get the VIN off the chassis plate? Tom, Volvo had the best idea regarding parking tickets. A plastic clip on the O/S of the windscreen.Wish more manufactures would do the same. Although when checking a VIN number we're supposed to check under the bonnet on door post's or even in the boot compartment too. My Picassa has one, too. I agree with Neil,some do drop off the system ! What about the testing weights ? Sometimes there is no weight given for the brake test. Also had 3 land rover free landers in on same day all the same model one had a brake test weight 150 kgs lighter than the other two. Think some fine tuning required. Also check list time clock not been changed. These hints and tips are pointless rubbish , telling us things we already know , next they will be telling us you can only test a vehicle on a testing bay!!! Cars coming in for MoT after a long period of inactivity (older Austin Mini's etc.,) of say 15 years or more seem to 'lose' their identity on the database. It would be useful if the tester could re-apply evidence based information at the point of testing. The time stamp issue has now been fixed and the correct time should now be appearing on the MOT inspection sheets. I've had a couple of tests where it says it's being done too early for the extra month to be added, yet on the .gov vehicle check site it says there is no mot at all. And the presenters agree they have no mot. It can't always be trusted. I have had a few problems with older vehicles that contain - / figures in the VIN numbers . These do not seem to appear on the MOT system. Also since the change in the computer system some older makes of vehicle have been dropped. In these situations you should enter the VIN without the - or / and other special characters (ie anything that's not a number or letter) and you should be able to find the vehicle. If you're still having problems finding the vehicle after trying this then create a new vehicle and type in the full VIN including the - or / and other special characters. I hope this solves the issues you've been experiencing. It would be helpful if we could alter the make and model details on the register screen if they are incorrect, like we used to be able to on the old system. This time stamp issue has now been fixed and the correct time should now be appearing on the MOT inspection sheets. I've also passed on your comments about adding the test number to the PDF to the development team who will look into your suggestions and see if they can be incorporated into the new MOT testing service. I’ve passed your comment on to our development team who'll look into your suggestions and see if they can be incorporated into the new MOT testing service. If you dont do this already, ask yourself "should i be testing ?"